Pure beauty and deep, fearsome mystery collide in the music of Rumpistol. For 15 years the Danish musician Jens Christiansen has been composing experimental electronic music and earning the utmost esteem from the global electronic literati. Jens was an early innovator, working with organic downtempo aesthetics that are popular today but well ahead of their time. His work helped establish archetypes for what is today referred to as IDM. Hailing from Denmark, Jens performs frequently in Europe but rarely in the United States. His recent stateside performances have taken place within the Tipper & Friends infrastructure, introducing Rumpistol to new audiences and invigorating those audiences who were already hip to him. 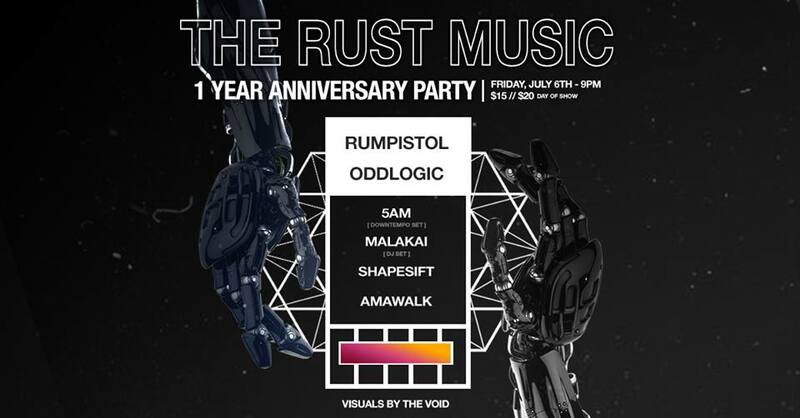 The Rust Music is honored, then, to host Rumpistol for our One Year Anniversary Party on July 6th in New York City. Ahead of this performance, we had the good fortune to correspond with Jens about his inspirations, compositions, performances and homeland. Jens has also provided an exclusive 50-minute Rumpistol mix to help everyone choon into his vibrations ahead of July 6th. Within it one can hear how Rumpistol epitomizes that rare and prized balance between intellectual and physical appeal. His music can be equal parts lush and abrasive, stoic and manic. His sound is appropriate for both a dance floor and a sitting den. The Rust: What influenced you to choose music as your full time career? Jens: I guess I always knew I wanted to work with music somehow. From early on I wasn’t interested in anything else, but I was uncertain about choosing it as a career. When I reached my early twenties I decided like most people do at that age to “grow up” and keep the music as a hobby. So I went to university and studied comparative religion for two years, which was pretty interesting. The problem was that I was really bad at doing my homework because I was too busy making tracks. I was still at university when the first album came out and suddenly I experienced all this interest and positive feedback from around the world. This eventually led me to leave university and follow my lifelong dream. The Rust: How do non-western traditions and sounds influence the Rumpistol project? Jens: I think the most avant-garde or ”unheard” sounds today comes from non-western traditions. In the west we're still obsessed with re-experiencing our own past and I'm definitely also a victim of that, but still it's always possible to step out and go somewhere else. So I try to look for inspiration outside of western pop culture, and always enjoy listening to a new Soundways or Finders Keepers compilation or play around with Ethiopian jazz scales etc. The bridge in “Forest Drops” actually has some Ethiopian jazz scales in it, and features the West African instrument Kora played by the great Dawda Jobarteh. Check out my Kalaha Crates playlist on Spotify if you’re curious on more global sounds. The Rust: Please tell us about your other musical project. Jens: I play synths and produce for Kalaha which is keeping me quite busy these days. We are two electronic musicians and two jazz musicians and we tour quite a lot in Europe and Asia. I really love playing with these guys because of the collective feeling we have. We bounce ideas off each other, an element I often miss as a solo artist. I started my musical endeavors in various bands as a kid and it’s definitely something I’ve been missing. I also have other projects. I produce for different artists who likes my sound and I do a lot of commissioned work as well. Last year I did a score for a modern dance piece, a short film, a documentary, a podcast and a score for a video game called Trailmakers. The Rust: Is there a specific meaning or idea behind the latest EP? What inspired the concept of ‘drop’? I live in a country surrounded by water. Denmark consists of more than 100 Islands and we have 180 days of rain each year in average. I also started swimming during the process which inspired me a lot; the mental break it gives you and the feeling of immersion you get. Of course drops can be so many other things: teardrops, bass drops, liquid medication, and of course to unload something - to release something. The Rust: What is it like to be a musician in Denmark? Can you tell us about music culture in your country? Even though we’re experiencing a lot of cutbacks these days, Denmark is still extremely kind to it’s artists compared to other countries. What many people don’t know is that we actually have a pretty decent minimum wage for musicians which I think is a non-existent concept in most countries. We also have organizations for composers where we can get free legal help and apply for grants. Plus all of the educational system is free. All this has helped creating a super fertile musical environment with high levels of talent for such a small country. Many people think that because of the small size of the country, we all know each other, which is partly true. However it’s not always too easy really getting to know a Dane! We’re generally a very disciplined but also a bit shy and slightly anxious bunch, obsessed with little details which I think explains why we also love to party. We simply have to let go of all this control sometimes. The Rust: Can you describe the process behind putting together Drops Remixes? How did you involve other producers? The remixers are all people I met during the last couple of years of touring. An aspect I really appreciate about traveling with music is how new creative collaborations emerge out of just hanging out with people you meet. Often you learn that you share the same taste in music or whatever and you realize that you can create amazing new things together. The remix can be a good way of trying out a collaboration. The Rust: Are there any other artists or musicians you have been feeling motivated by recently? When I’m not working on music myself I try to give my ears a break. At the same time I have to admit that I'm seriously addicted to music and often get obsessed with certain artists and genres so it’s really hard for me to turn it off sometimes. Still I believe that it makes you become more balanced and creative if you allow yourself some silence at least a few hours each day. I do enjoy listening to audiobooks and podcasts like Soundtracking and I often have these phases where I dive into a certain artist or genre. Neo classical stuff like Jóhann Jóhannsson (RIP) and early IDM like Future Sound of London & April Records for instance. When we’re on tour with Kalaha we listen to a lot of music from around the world: African music, Middle Eastern music, electronic music and jazz, which keeps us going for those long road trips. Sometimes we also plug in the laptop to the sound system of the car and work on tracks while we drive. So much fun! Last I love the fact that we're finally seeing more women break through within the experimental electronic scene: Holly Herndon, Laurel Halo, Smerz and my fellow Dane SØS Gunver Ryberg just to name a few. We definitely need more female role models within this scene! It can be many things but generally, I think boredom and silence is the best starting point for me. Being swamped in work or overwhelmed by too much stimuli doesn't work for me. It's already hard to find the energy and time having two kids and playing shows every other weekend. We thank Jens for squeezing us into his schedule and sharing his words and music. Two kids, two musical acts, and one record label, Rump Recordings, surely make for a busy man. Rumpistol has become one of those rare musicians that creates while his contemporaries and the generation proceeding him takes cues. But he is himself taking cues from the most disparate of places. He’s like a prism catching the light and reflecting it outward in varying colors. Jens follows his ears and his heart, not what’s popular. By doing so, he’s less a part of mainstream conversations. But he’s arguably leading a dialogue of greater weight and purpose on his own. At the outset, he was placing arrhythmic or obscure sounds within minimal, melodious arrangements. His innovations created space for future artists, including some of the supporting acts at the One Year Anniversary Party, to step outside traditional frameworks of electronica. We hope that electronic enthusiasts from far and wide can come enjoy his rare New York City performance at on July 6th. If the light is just right and one watches from a fortunate angle, one may catch a simultaneous glimpse of the past and future. Grab tickets HERE, and enjoy the this exclusive Rumpistol mix for years to come.